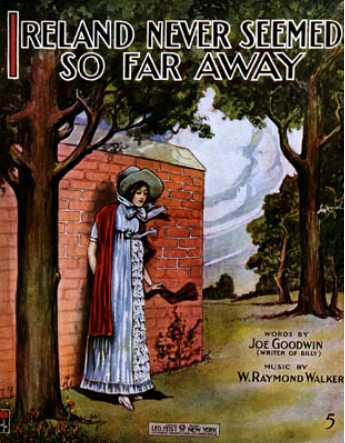 Like This 1912 Sheet Music Cover. For over 400 years, the United States has been a second home for thousands of immigrants from Ireland. As early as the 1600's, nearly 100,000 citizens had left the Emerald Isle for America, and by the early 19th century that number had increased at least tenfold. The Irish, like all immigrants, brought with them the culture of their native land. Irish immigrants had an especially strong influence on American popular music. Nostalgia Reigns Supreme In This 1912 Tune. 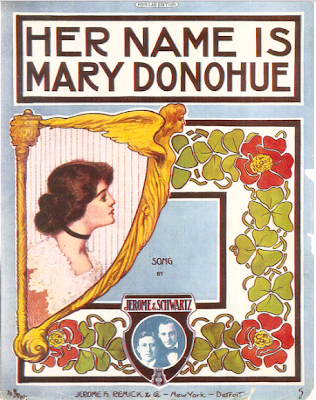 Themes of Irish interest played a major role in the development of the sheet music industry in the United States, with hundreds of tunes aimed at the immigrant market written in New York City's Tin Pan Alley. 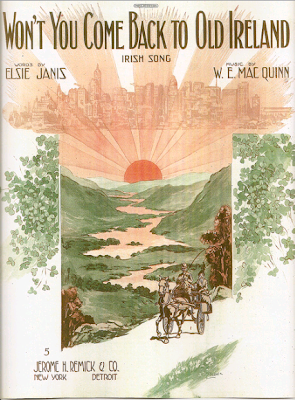 New York University's Tamiment Library, home to The Archives of Irish America, has recently digitized part of its collection of thirteen hundred pieces of sheet music published between the Civil War and World War I, focusing on songs about Ireland and the Irish. Lyric Sheet Published Without Music. The sheet music is part of the The Mick Moloney Irish-American Music and Popular Culture Collection, which is the largest known and most comprehensive collection of Irish Americana in the world. 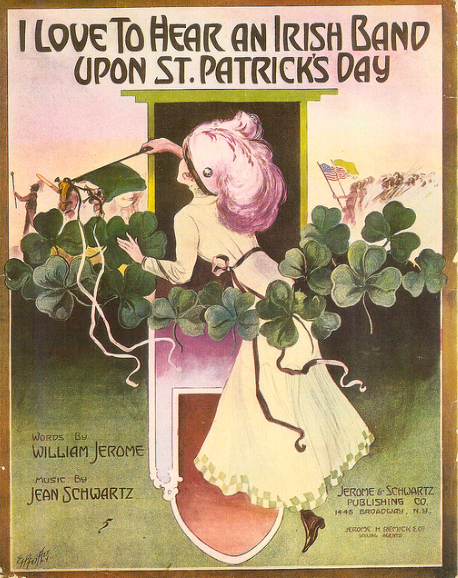 This immense archive includes forty-three boxes of sheet music, which document the Irish image in American popular culture, including both positive and negative stereotypes. The songs cover a wide range of genres, from the sentimental to the patriotic to the comic. Could This 1909 Tune Be Irish? 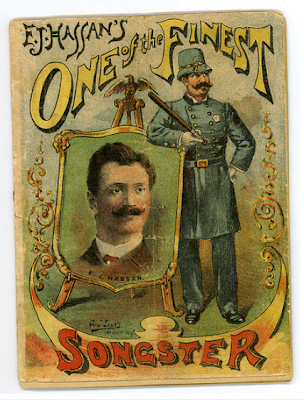 Sheet music was a hugely lucrative industry, particularly from the 1860's to the 1930's, and composers, lyricists, and publishers used every major political, sporting, and cultural event as fodder for new tunes. As a result, song sheet covers, richly illustrated with colorful art to stimulate sales, became a virtual history of the struggles and achievements of the Irish in the New World. Colleen's Inspired This 1891 Waltz. 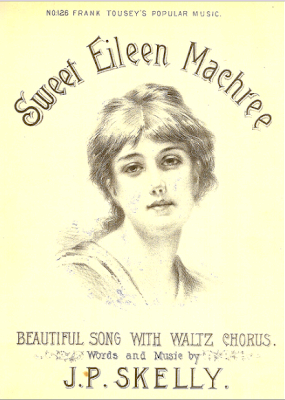 Songwriters were especially drawn to a few popular themes, using words and images that were instantly identifiable as Irish. Place names such as Killarney, Tipperary, and Kilkenny already had a musical sound, so they were naturals for conveying a magical land of lush green hills and crystal clear rivers, which of course never actually existed. Many songs contain the Irish words Mavourneen, Macushla, and Machree, meaning "My Dearest", "My Love" and "My Heart." And the beautiful Irish Colleen provided instant inspiration, becoming "Peg O’My Heart," "Pretty Kitty Kelly," and "My Wild Irish Rose." Appropriately, the donor and namesake of the sheet music collection is a famed musician, as well as a scholar. Mick Moloney is a tenor banjoist and vocalist who holds a Ph.D. in Folklore and Folklife from the University of Pennsylvania. He is a Global Distinguished Visiting Professor in NYU's Faculty of Arts & Sciences, teaching in the Department of Music and for the Glucksman Ireland House, whose publications include Far from the Shamrock Shore: The Irish-American Experience in Song (2002). For the past twenty years he has pioneered the collection of Irish-American memorabilia, and in 1999 he was awarded the National Heritage Award from the National Endowment for the Arts.